HAO reader Devrah emailed me a picture of the fabric wall art she made. I love it! She wanted a 6' x 2' piece of art, so to save money, she bought two 2' x 3' frames and screwed them together, then stretched black and white IKEA fabric over the whole thing. And the best part: she used orange fabric paint to fill in some of the shapes in the print to coordinate with her bookshelves, shown below. Genius! It looks like IKEA is no longer selling the exact print Devrah used, but you could add your own color to one of these black and white prints. For instructions for stretching fabric over frames, see here. That's so great! Especially filling in the orange! Way to go, Devrah! I never would have thought to add color to a fabric that way! What a great idea! great idea when you need to fill up some space. I am in need to clean out my space! That is totally brill. Love it. I'm definitely storing that in my mental file! Cool!!! That's cool! really. you have a great sense of art. I totally want to do this right now! Devrah, that shelf color is the best! That's such a great idea! Thanks! I can't find fabric to match my mango colored breakfast nook. Whenever we get the bench built, I plan on getting one of IKEA's black and white print and painting in the exact shades I need. Gotta love Ikea...fun stuff all around and great design! Check out this cheap and easy frame from IKEA just for displaying fabric as art. 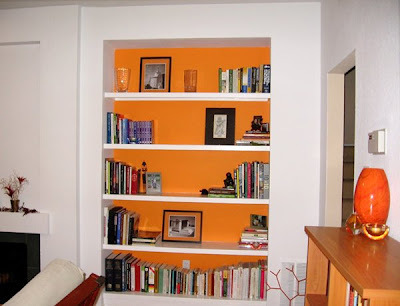 I LOVE the orange behind the bookshelves! Brilliant idea! thats a great idea ! 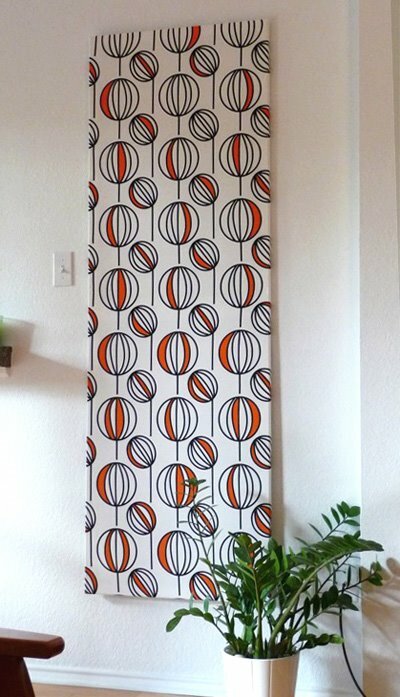 I bought a leaf pattern print at IKEA to add some privacy to my art studio (one wall is full of interior-facing windows — it's an odd old space). I color in a little every day to kickstart the creative juices. And I ask guests to color it in whenever they visit as a way of leaving their mark in the space. I totally made this! I had DH create a 8 foot high frame, stretched some flocked fabric over it and painted a few of the voids. It is perfect for our huge wall and I picked the colors for a total custom look. Everybody that comes over loves it!